In last week’s post, I mentioned that my time in Kitchener was a bit of a missed opportunity since I didn’t take advantage of the opportunity to shoot the busy GEXR operations in the city. On my recent trip to Kitchener-Waterloo, I made up for that by taking some shots of GEXR operations near the Kitchener Via Rail station. But there is another rail operation in KW that I similarly neglected to chronicle when I lived in the area. So, on a recent visit to the area last November, I made sure to search out the Waterloo Central Railway facilities in St. Jacobs and photograph what I could. Even though the tourist line’s motive power, including ex-Essex Terminal Railway 0-6-0 steam locomotive, WCR GE 70-tonner 1556, former National Research Council MLW S3 switcher (originally CP 6593) and the other motive power were tucked away in the railway’s shed, I had a great view of the railway’s colourful rolling stock, which was easily accessible from adjacent streets and publicly accessible areas. This old Via Rail heavyweight was closest to the WCR maintenance facility. A string of other passenger cars, of different vintages, was just down the line. For those who may not be familiar with this railway, it has an interesting history goes back to Canada’s unofficial Railway Town, St. Thomas. That was where the Southern Ontario Locomotive Restoration Society originated. This group now operates the WCR and carries out its restoration work in St. Jacobs. But the tourist railway’s origins go back to 1997, when the Waterloo-St. Jacobs Railway began operating between Waterloo’s old train station on Father David Bauer Drive and the village of St. Jacobs, with a stop at the St. Jacobs Farmers Market (between the city and village). That operation, which purchased CN’s Waterloo Spur, folded in 2000. Soon after it stopped running trains, the Region of Waterloo bought the trackage, which cleared the way for WCR years later. After a short stint operating a tourist train in 2003, there was no tourist line on the old spur until 2007 when the SOLRS established the WCR and transferred all its rolling stock and motive power to Waterloo. The tourist line has been operating on the spur ever since, with the Goderich Exeter Railway providing freight service at night all the way to Elmira, where the spur ends. At the end of the 2014 tourist season, WCR lost its running rights south of Northfield Drive, which effectively meant they would no longer use the old Waterloo passenger station as a starting point. That decision was made so that the region could use all trackage south of Northfield Drive for their Ion light rail operations, which will begin operations shortly. The WCR now bases its trains out of the St. Jacobs Farmers Market area, just north of Waterloo and operates regularly from spring to fall. The railway takes tourists from the Farmers Market into the old village of St. Jacobs and even operates specials as far north as Elmira for that town’s Maple Syrup Festival. In December, WCR also operates Christmas specials for families. Sadly, when I visited the region, the railway had just finished its fall operations and was weeks away from beginning its Christmas operations. Oh well. Another interesting facet of this railway’s operations include railway training school for those looking to earn their engineer, conductor or safety crew certifications. All was quiet when I visited the railway’s yard in St. Jacobs, but what a collection it was. I was thrilled to get some shots of old Via Rail heavyweights, still in their iconic blue and yellow. WCR also has various older passenger cars still in their classic Canadian Pacific and Canadian National colours. These cars are in various states of restoration. Closer to the main shed, the railway has three cabooses. The two yellow cabooses are WCRX 1040 and 1042, formerly of the Essex Terminal Railway. Further down the line, the old wooden caboose sat by itself. This car was a former Toronto, Hamilton & Buffalo caboose, built in 1914. I couldn't get too close to this caboose since I didn't want to intrude on private property. This shot gives you an idea of how bad the weather was when I came to shoot these old relics. Just north of this main collection of cars, there were a few gems, which are accessible from the end of a residential street and a pedestrian crossing over the tracks. I wasn’t sure if this trail was public, so I stayed on the street and to the side of the tracks, as I was not keen to trespass, especially in an area where I was unsure of the property lines. This boxcar was the highlight, a former TH&B boxcar with a Canadian centennial logo to the right of the door. I also thought this was a cool find. The railway appears to be in the process of rehabilitating this old Canadian National heavyweight baggage car. I love the old CN passenger colours before the railway adopted the black and white scheme with the wet noodle logo. But, the expedition proved to be a real treat for me, even if I wasn’t able to see this fascinating railway in action. The next time I am in Kitchener-Waterloo, I will be sure to try and ride the WCR. I would suggest anyone who has an appreciation for railway history to check out this gem when they get a chance. It’s well worth the trek up to St. Jacobs. My two years spent in Kitchener-Waterloo seem like a lost opportunity to me, in some ways. I worked in Kitchener for two years and, for the most part, enjoyed my time there immensely. But as I look back, I wonder how much railfanning I could have done, had I had a mind to do so when I lived there. At the time however, I was not into railfanning so the only photo I have from my time in KW is a shot from Kolb Park of the train trestle over the Grand River, which you can see inthis post. However, I had the opportunity to turn my regret into something positive when I visited KW with my family in November. On a gloomy, misty Sunday, as my wife attended a conference, I took my girls with me to Kitchener so they could visit The Museum, a kids-focused museum on King Street in Kitchener. I made sure to plot a route that took me past the Kitchener Via Rail train station on Victoria Street. When we reached the station, I finally saw some active Goderich Exeter Railway freight operations in action. This was the first time I have photographed this fascinating railway. You will remember from my numerous posts about Goderich, Ont. that I have tried to capture some active GEXR operations for years, but have always had to settle for some static images, like this shot of a pre-Genesee &Wyoming livery GP9 parked in the GEXR Goderich yard, just up the hill from the salt mine on Lake Huron. I've finally seen some live GEXR operations. Well, wasn’t my timing just perfect when I saw a duo of GEXR geeps and a tank car back into a spot in front of the GEXR offices, right next to the Via station. I have always told myself it would be cool to get some photos in this spot with those iconic vintage industrial buildings in the background. I began from this angle, since the two units were still moving. I wasn’t sure how long my window would be to catch this tiny consist (which was about as long as the Arnprior Turn, incidentally). The two units then stopped and the crew began to shuffle around outside, which allowed to try some different shots and get a bit more detail. The first unit, obviously of UP origin, is a leased unit from Locomotive Leasing Partners, still in the UP sergeant’s yellow. This is a fact of life for short lines. Very few seem to have their own fleet of colour-coordinated motive power now. I was pretty happy with this shot, which I framed between the Via station (left) and the GEXR building (right). Upon closer inspection of the G&W painted unit, I was pleasantly surprised to see it was in fact a Quebec Gatineau Railway unit. This short line is just across the river from me in Ottawa, but I have yet to get some solid information as to when it would be best to shoot the QGRY’s operations near Buckingham. I still have it on my to-do list, but this contact might be the next best thing until then. I tried to get a close up of the “Kitchener” sign that was perched on this pipe next to the short consist. I’m not exactly sure if this pipe is connected to an underground fuel storage tank or serves some other purpose. Given that crews seem to change here and the railway has a small yard just to the east of this spot, I am speculating that this might be a servicing point. Someone who is more knowledgeable than me can let me know. One last overall shot. I really like how the old industrial buildings provide the ideal background for these units. There is a timeless quality to this scene, which could be taken at any time. The crew on this consist must get the occasional railfan on the platform. They didn't seem fazed by my presence. I thought I was done so I took my girls to the museum where they had a ball. On the way back to our hotel, I was happy to see another GEXR train doing some shunting near the station, although it was blocking a fair bit of traffic on Lancaster Avenue. Much of the train seemed to be comprised of covered hoppers, which made me wonder if it was carrying the products of the fall harvest. I was in a left turn lane trying to get onto Lancaster. After waiting through too many light cycles, I pulled a U turn and made my way to St. Croix Street, since the train didn’t seem to be in a rush to clear the crossing. I was able to get this fleeting glimpse of the head end of the train, which finally backed into the yard and cleared the crossings. This was taken just off St. Croix Street, behind a plaza that was next to the Guelph Subdivision tracks. The lead unit reminded me of the old Seaboard System/Family Lines System locomotives that sometimes made their way to CSX’s Canadian operations near Windsor and sometimes even Sarnia. Upon closer look, the unit turned out to be QGRY 6908. You can just make out the G&W style logo on the short hood. What’s interesting about this little bit of luck is that, just the day before, I had a chat with a friend from Kitchener and I was telling her that living with regret isn’t necessarily a bad thing. I told her that I really resent people telling me that’s it unhealthy to live with regret. I understand the sentiment, but I really do believe that resenting something in your past is never a bad thing, if you use that resentment as motivation to make things right. This is one time when I was thankful for resenting missed opportunities. If there was one downside to this railfanning experience, it was that the weather was pretty awful, as I had to contend with rain and mist, which made for some interesting touch-ups. If you want to see much better photography of GEXR operations, check out Steve Boyko's Kitchener Rainfanning post from his blog, Confessions of a Train Geek. I'm glad someone had decent weather in KW! This is the first in an ongoing series that focuses on questions I sometimes come across in the comments section of the blog. The first question goes back to October 2016. A fellow railfan from Sarnia reminded me that I intended to tackle the question below from that fall post. Q: What's the significance behind the CN Hobson sign near the eastern portal of the Paul M. Tellier Tunnel? In October 2016, I was in Sarnia to visit family for Thanksgiving when I stopped by the Sarnia Via Rail station to catch some trains. I caught this westbound train heading toward the tunnel. As I did, I noticed that there was a curiously named control point sign west of where I stood on the station platform. For the most part, most of the control point signs I have seen have fallen into the category of geographic name or historical marker. In the case of this sign, Hobson, the control point is a little bit of both. But it wasn't as straightforward as I thought it would be to find out why CN predecessor Grand Trunk named this CP Hobson. Here's a closer look at the sign, blown up from the photo above. In and around Sarnia yard, there are a few control point signs that you can see from public property. There's CP McGregor, which is named after McGregor Side Road, which I assume once crossed the yard. There's CP Blackwell, named after two nearby roads, Blackwell Road and Blackwell Side Road, which intersected at the site of old Blackwell station. The name Blackwell owes itself to Thomas Blackwell, onetime president of the Grand Trunk Railway, which operated the Strathroy Subdivision prior to its absorption into CN. You can read more about this CP here. Okay, so you get the idea. Usually, a railway will name points along its lines for nearby geography or to pay tribute to its history. CP Hobson is not named after any neighbourhood or road of the same name in Sarnia. I checked for any Hobson Road and found none. However, when I did a search on Hobson and Street, I found a reference to Joseph Hobson in a report on Sarnia's history. Hobson, it turns out, was the engineer and architect who designed the St. Clair Tunnel beneath the St. Clair River. He was assigned the task by the Grand Trunk Railway in 1886. The tunnel was opened in 1891 and was considered an engineering marvel at the time, being the longest international underwater rail tunnel in the world at the time. Hobson went on to serve the railway as its chief architect. I found a few articles about Hobson, but I found the best synopsis of his career was in his Wikipedia profile. Here's another lesson I learned from this mystery. Always take pictures of the mundane because you never know when they will come in handy. Case in point. Here's a piece of the original bore that was used to drive the tunnel beneath the river. I snapped a photo of this monument as I was waiting for trains on the station platform. I guess I should have paid some attention to the writing on this plaque when I was organizing my Sarnia photos in my trains images files. It turns out that Mr. Hobson, in addition to having a control point named after him, also has a small monument devoted to him by the Canadian Society for Civil Engineering. So, my guess is that milepost 59.2 CP Hobson was probably so named by the Grand Trunk and the name obviously was retained when the line became a CN line. So CP Hobson is both a tribute to the man who designed the tunnel and likely also named for its close proximity to the old tunnel, which is just a short ride west of the sign. If you ever have a question when you are reading any of these blog entries, be sure to let me know. I'm glad someone reminded me of this little piece of trivia. Sorry for the delay, but better late than never, I hope! I had an interesting finish to 2017. I was the only person on my team at work in between Christmas and New Year's Day, so I had some time to relax a bit. When I was scrolling through Twitter one day over lunch, I found something interesting that made me think. This photo, above, is what I saw on Twitter. No, I haven't started a BBS Twitter feed. 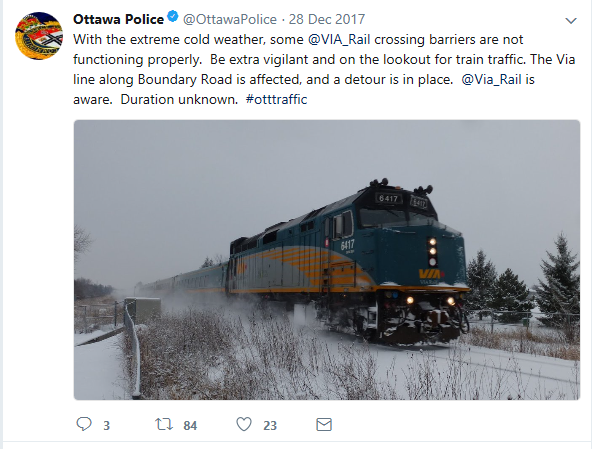 Someone found an image I took of a Via corridor train near Cedarview Road and used it in their tweet. This shot was taken in January 2016 and was one of my periodic attempts to capture some quality winter shots for my collection. I'm pretty fond of that shot, so I was naturally quite surprised to find the image front and centre in an Ottawa Police tweet. I am always flattered when someone notices my work, but I was a little bit disappointed that no mention was made of where the photo originated. I realize there is no room for such courtesies on Twitter, but the discovery left me a little disappointed. I wasn't all that upset, mind you, because I have always taken a laissez-faire approach to posting photographs online. I don't include any watermarks on my photographs and it hasn't been a problem, for the most part. Only twice have people tried to use my photos with no permission, attribution or credit. I don't mind the police service using this shot to illustrate an important public safety issue. A little while ago, someone used one of my photos in a forum and seemed to be passing it off as his own. I had to politely tell him that this shot was, in fact, mine. I understand that the online world can sometimes seem like the Wild West, but most people connected with this blog or other groups that I frequent are quite respectful. I'm wondering what you think of this use of my photo. What's your take on this? I should mention the fact that the recent cold snap has played havoc with many things in the city, including the Rideau Canal skateway (too cold to skate on, if you can imagine that). The cold has also messed with the crossing signals on the Smiths Falls Subdivision through Barrhaven. This is nothing new in this part of the city, as these signals have had their share of problems over the last several years. I'm surprised with how little reaction there is to these malfunctions now. The cold has also hampered my efforts to get out and get some shots. A freaky string of ailments and bitter cold has prevented me from getting some shots of late. Just today, I had the chance of getting a nice shot, but I was not able to safely pull over on a snow covered road to get a nice winter shot. Oh well. I was going through some old shots that have been forwarded to me and decided to share this shot, sent to me by my brother Marc. He caught an unusual display of power on the Point Edward Spur in downtown Sarnia, near Front Street last October. I haven't seen these geeps on this line often, although my experience is admittedly limited. I have seen the old warhorse GP9s and slugs on this spur, but very few of these newer geeps. I like this shot because the geeps are pulling an interesting covered hopper back from the grain elevator on Sarnia Bay. It's still labelled Conrail but its reporting mark is from the old New York Central (that mark is now a CSX mark). Think about how that reporting mark has changed hands: from NYC to Penn Central to Conrail to CSX. I also like the limo in the shot. This image has a lot of cool elements. Here's another shot my brother caught from Waterworks Road, near Bright's Grove, as a westbound CN freight train made its way down the Strathroy Subdivision toward Sarnia Yard last October. This is a cool shot, given that my brother was fairly close to the crossing and the motive power looks pretty dramatic. Sticking with the random theme, I should mention that the consortium behind Ottawa's new Confederation Line LRT informed the city that the line will not be ready on time in May, as had been previosuly expected. This is not terribly surprising to those who have followed this project. The city has not been discussing the official launch date of the new line for quite some time, which has caused many in the media to speculate that the project will not be ready in time. I recall early talk about an April 2018 launch of service, but more recent media has noted that city documents have pegged the launch of service as being closer to the end of May. Now, it appears the actual launch of O-Train service is anyone's guess. One final note. This shot is a little preview of some railfanning I was able to get in on a recent trip to Kitchener-Waterloo. I managed to document a fair bit of action and railway history while in the Waterloo Region recently. I have also been chipping away at some more rail history posts, including some material about the old Lachute Sub and the old Ottawa & New York Railway. I am hoping that this year will allow me to continue exploring rail history on this blog.